Kingfishers are an easily recognized group of often colorful birds around the world. Although they have traditionally been placed in a single family, there are three distinct lineages that are well-supported by a range of molecular, anatomical, and molt evidence (Sibley & Ahlquist 1990, Moyle 2006). Sibley & Monroe (1990), based on the degree of divergence shown by DNA hybridization evidence, separated these groups into three families. This was followed by some authorities (e.g., Fry et al. 1992) but not by others (e.g., Dickinson 2003). Reviewing the evidence, Christidis & Boles (2008) wrote that "there seems little doubt that each group is a monophyletic group, which together form a monophyletic kingfisher clade. The level of differentiation seems to warrant recognition of three families of kingfishers." However, the majority view appears to be that taken in the I.O.C. checklist: while the "three are reciprocally monophyletic groups [they] ... are not the same rank as the other families in the Coraciiformes." See the subfamily pages for much discussion of these lovely birds. 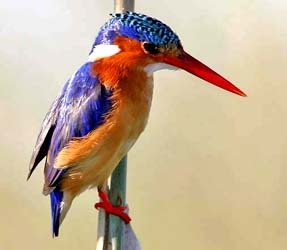 Photos: The Giant Kingfisher Megaceryle maxima (top of page) was in the Okavango Delta, Botswana, in July 2005The Malachite Kingfisher Corythornis cristata (above left) was in the Okavango Delta of Botswana in July 2005. 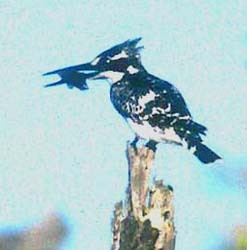 The Pied Kingfisher Ceryle rudis (above center) was from a hide in Kruger Nat'l Park, South Africa, in July 1996. Hans & Judy Beste photographed the Buff-breasted Paradise-Kingfisher Tanysiptera sylvia (above right) in n. Queensland, Australia, about 1978. Photos © D. Roberson, except the paradise-kingfisher © Hans & Judy Beste, used with permission; all rights reserved. Fry, C. Hilary, Kathie Fry, and Alan Harris. 1992. Kingfishers, Bee-eaters & Rollers. Princeton Univ. Press, Princeton, N.J.
Hilary Fry is well-known as a co-author of the fabulous Birds of Africa handbook series. He has also done a lot of research on bee-eaters and, to a lesser extent, kingfishers. His earlier family book on Bee-eaters (1984) in the Poyser series was well received. This volume, written a dozen years later, is expanded to cover the kingfishers and rollers, but Fry's forte remains the bee-eaters. I found the bee-eater text much better than the kingfisher text. On the other hand, Alan Harris — the artist for this 1992 book — does a fine job with this colorful family, and thus this is a very attractive book. Leafing through the plates is a great treat [like all the family books in these series, the plates are grouped together in the front, with the text following]. Fry's species-level taxonomy is rather conservative, especially these days. He includes only 87 species of kingfishers while Woodall (2001) has 92 species. I think the latter is nearer the mark given current trends. Fry, Fry & Harris follow the Sibley & Ahlquist (1990) taxonomy at the family level, and thus discuss three separate families of kingfishers [but their Dacelonidae became the Halcyonidae by Woodall (2001) on priority grounds]. Perhaps the most annoying part of this book to me is the repeated statement "nothing is known" about this or that species. 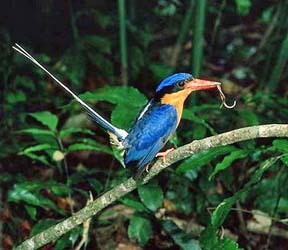 Consider the White-rumped Kingfisher Halcyon fulgida of Lombok, Sumbawa, and Flores in the Lesser Sundas. This book says "almost nothing is on record" about the species, which is "barely known" but "must be unmistakable." Perhaps that was a fair statement in 1984, but by 1992 surely quite a bit was "known." I believe Ben King had been running Lesser Sunda tours for a decade and routinely found this species. According to Woodall (2001) it is considered "widespread, and fairly common" on at least Lombok and Flores. It was not that the species was not "known" by 1992 — it was that much new information had not yet been published. Had the authors or publisher had the text reviewed by some knowledgeable birders, they could have added a lot. But, like many academic efforts, the unpublished knowledge held by birders was overlooked in favor of a simple literature search. Thus this 1992 book essentially recites a 1960s level of knowledge. Nothing was "dug out" about the little-known species. The net effect is that the African species that the Frys know well are nicely covered, but Asian and Australasian species receive comparatively cursory review. So this is a pretty book but not a great family resource. Today, with Woodall (2001) available, that HBW volume is the preferred text. Plus it has spectacular photos and exceptional artwork! There is another major family book — two volumes, in fact — by Forshaw & Cooper (1983-1985). These coffee table tomes were priced in the thousand of dollars and may have made money for the author and artist, but are unavailable to the rest of us. I've never even seen one. Unlike their earlier work with parrots, a cheap, popularized single-volume version has not appeared. Forshaw, J.M., and W.T. Cooper. 1983-1985. Kingfishers and Related Birds. 2 vols (Kingfishers). Lansdowne Editions, Sydney. Fry, C.H., K. Fry, and A. Harris. 1992. Kingfishers, Bee-eaters, and Rollers. Princeton Univ. Press, Princeton, N.J.
Marks, B.D., and D.E. Willard. 2005. Phylogenetic relationships of the Madagascar pygmy kingfisher (Ispidina madagascariensis). Auk 122: 1271-1280. Moyle, R.G., J. Fuchs, E. Pasquet, and B.D. Marks. 2007. Feeding behavior, toe count, and the phylogenetic relationships among alcedinine kingfishers. J. Avian Biol. 38: 317-326. Woodall, P.F. 2001. Family Alcedinidae (Kingfishers), pp. 130-249 in del Hoyo, J., Elliott, A., & Sargatal, J., eds. Handbook of the Birds of the World, vol. 6. Lynx Edicions, Barcelona.